The weekend is when I do my baking, and as this past weekend rolled around it was no different. I got the itch. The baking itch. I began to browse recipes when I came across this recipe on Martha Stewart’s website. I recognized it was from the cookbook Baked, which I previously checked out from the library a while back, drooled over, and then photocopied some of the recipes. This was one of the ones I photocopied! (Oh, wait, is that illegal?) After thinking more about this recipe, I was pretty sure one of the blogs I read had made them too. Sure enough, I found it on Peabody’s blog (just try going there and not drooling, I DARE YA!). I’m VERY glad I remembered Peabody’s because she adapted the frosting recipe, and then I adapted it a bit more. Now, yall know I love pumpkin ANYTHING (including shampoo and handsoap!). 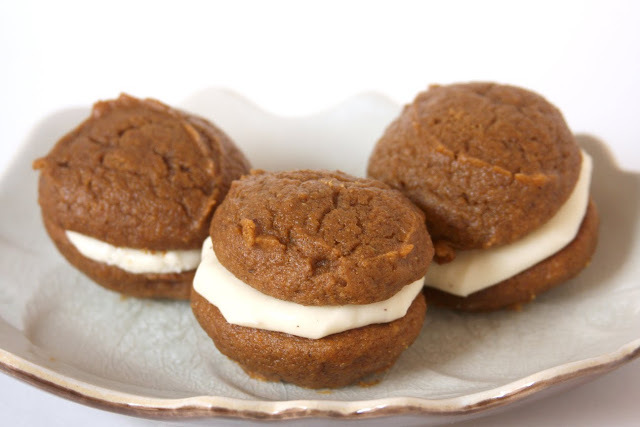 And these whoopie pies rank right up there with the best of the pumpkin treats. As my first venture into whoopie pies I’m now hooked. I love these little handheld treats. They are like a cross between cupcakes and cookies. They are less crumbly than cupcakes, and totally handheld without wrappers. They have FROSTING sandwiched between! Mmm mmm… The pumpkin flavor isn’t overwhelming. The Boy isn’t a pumpkin fan, but managed to eat 4 the first day. His comment was that they tasted more like gingerbread. I brought them into both his work, and my work, and they were rather well received! I decided to try to make these a *touch* healthier, and I subbed 1 cup of all purpose flour for white whole wheat flour. I honestly don’t think you could tell at all. In fact, I’d be curious to see how they taste if you up the ante even more. Also, Peabody adapted the original cream cheese frosting, into a maple cream cheese frosting. I recommend that option 1000%. 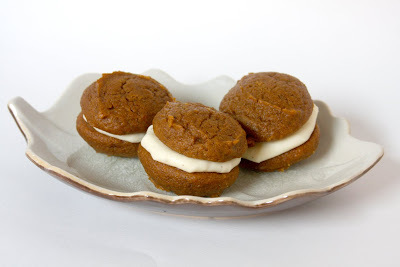 The maple flavor cuts the sweetness of the frosting, and is the perfect accompaniment to the pumpkin. My adaption to that was to add freshly ground cinnamon. I tasted it before and after I added the cinnamon, and I definitely prefer it with! This frosting was truly amazing. I’d love to pair it with another cake flavor in the future! Add the powdered sugar, maple syrup and vanilla and beat until smooth. Add cinnamon. Be careful no to overbeat the filling, or it will lose structure. Turn half the cooled cookies upside down. Pipe filling (about a TBSP) onto that half. Place another cookie, flat side down, on top of the filling. Press down slightly so that the filling spread to the edges of the cookie. Repeat until all the cookies are used. Put the whoppie pies in the refrigerator for about 30 minutes to firm before serving. All this pumpkin stuff is killing me! It looks so good, but there's no pumpkin here. I just have to live vicariously through your blog pictures! I've had these on my list since last year! I'm going to get to them soon, I hope! YEA FOR MORE PUMPKIN! These were yummy! Oh, WOW, Erin! Those look insanely good and the frosting? Just give me the bowl and a spoon! I think I will have to make these for the pumpkin loving husband. 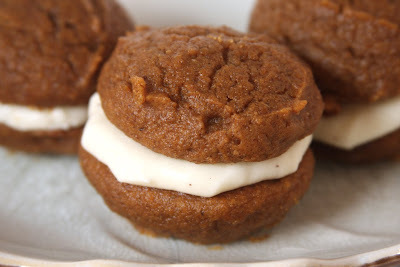 Fabulous looking whoopie pies and I love how you paired a maple flavored frosting! Wow, these look amazing and I love the maple in the frosting! Now I'm craving something pumpkin! I'm sold on the Whoopie Pie! The cake and frosting combination sound killer. Great for an early fall dessert! This filling looks delicious! I can't wait to make these! These look scrumptious!! Pumpkin has been VERY hard to get ahold of, but I'll keep trying so I can bake these up for my kiddos-they'll LOVE them!! I love the additions to the frosting! Uh – pumpkin shampoo? Do they really make that? I want some! Pumpkin Shampoo exists! And… it's awesome! Sounds like the perfect fall snack! I haven't made anything pumpkin yet. I need to get on the ball! these look great! Erin – this is crazy! These were what I made for Bridie's brithday, having seen Marth make 'em on TV last year. I felt like I'd been waiting forever to bake them as well. How large is each whoopie pie and how many does this recipe make? Well those two questions affect each other! The quanity depends on how large you CHOOSE to make them. I chose to use my medium sized cookie scoop, which is approximately 2 Tablespoons. I chose that size to make them bite-sized treats. I can’t remember exactly how many it made, but I remember it was over 2 dozen. I think around 30. You can always choose to make them larger, more sandwich sized, like a Little Debbie treat, and probably get 15 or so. I bought that SAME scoop a few months ago at a PC house party…and I haven’t really used it yet! I’m making a batch of these for a friend’s birthday tonight, and bite-size is what I’m aiming for. Thanks! Question about the batter. Mine is very, very thin and spreading all over the pan. I am an experienced baker and I measured everything correctly. I was unsure about the pumpkin puree and I made mine from scratch! Could that be the problem? Kudos to you & your homemade pumpkin purée! I know my batter was wet, but it wasn’t incredibly thin. I have never made my own purée, but I have heard they often have more moisture. It sounds like that was the culprit! Unfortunately, the only solution I can think of, is to just bake them in a cupcake/muffin pan. They might be denser than your normal cupcake. Hope that helps! Pingback: Harry Potter Party Menu: Desserts First!